Proudly display your school colors and honor your graduating class with this plush teddy bear. This plush teddy bear allows you to display any name & year along with the school color to be displayed on the t-shirt. This grad design is printed on our Sherman Teddy Bear. Sherman has an irresistible look on his face along with a wonderfully soft feel. He features contrasting tan fur on the inside of his ears and his snout. He's available in sizes 11”, 17" & 21" sitting, and makes a wonderful gift for any recent graduate. Free gift wrapping is included to create a thoughtful presentation. Free personalization of any name and year is included. Teddy Bear was cute, but eyes were very small. Personalized name could have been a little bigger. Bear was really cute but very small for the price. The personalization was awesome. 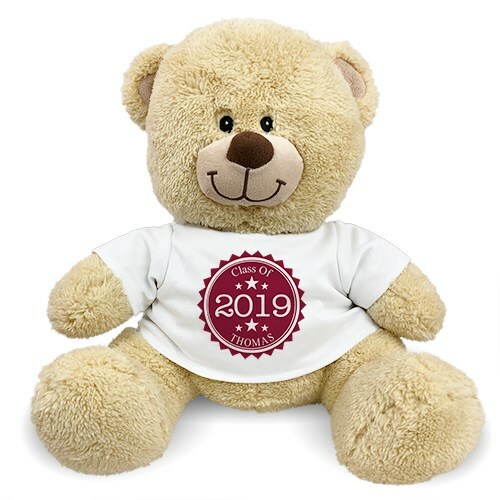 Additional Details Celebrate your favorite grad's big day with a personalized plush bear from our Graduation collection!